Rob’s big 3-0 is today and we’ve had a weekend of partying—vegan partying to be exact. 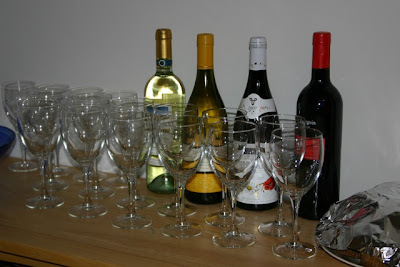 On Friday night we had a big party at our place. Overall, it went pretty well I think. It was standing room only in our house for a while, and people seemed to be having a good time. I made a bunch of stuff to eat—all of it vegan. I got pretty creative, with a vegan cream cheese dip for apple slices and even a vegan ranch dip for veggies. I also had chips and chismol; bread and crackers with regular hummus or pumpkin-chipotle hummus; sugar cookies; pumpkin spice muffins; and chocolate cake. I had this grand master plan to get everybody, even the carnivores, to start talking about how great the food was, and then at some point during the evening to reveal my big surprise to everyone, “ITS VEGAN, ITS ALL VEGAN!” It didn’t quite work out that way. First of all, I wasn’t too suave about keeping the secret, because as people arrived I tended to tell them excitedly, “Welcome the party! We have tons of food and all of it is vegan!” And secondly, our house got so crowded and loud that I would have needed some sort of megaphone to make the announcement. But people did seem to genuinely like the food, and I think that my vegan chocolate cake turned out to be the best one I’ve ever made. This was all the more surprising since I did not measure any of the ingredients—I’d been rushed and just sort of threw everything into a mixing bowl and hoped for the best. The only mishap at the party (despite the fact people were packed in our house like sardines) was that at some point we ran out of beer. Last year when we’d had a party for Rob, I’d way overestimated the beer consumption and ended up with a ton left over. This year I guess I way underestimated it. Hopefully next year, I’ll get it just right. Classy... We ran out of beer but had tons of wine left over. 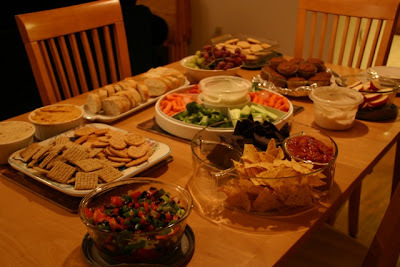 Some of our fabulous vegan party food! 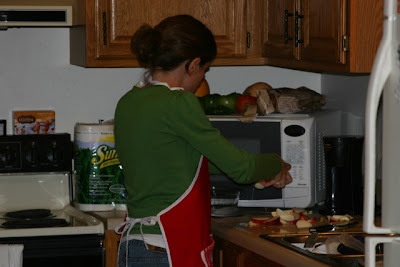 After the party, I stayed up until the wee hours of the morning cleaning (there were globs of salsa and bits of mashed vegan cake all over our house!). On Saturday afternoon we spent some time with friends, and then it was onto party #2 for Rob. This one was a family party, and Rob had decided that he wanted to have his family over to our place for dinner, cake, and ice cream. After much thought, I had determined that I would make ratatouille to put over pasta—its generally pretty easy to fix, and if I added enough eggplant (chewy in texture), maybe the meat-eaters wouldn’t notice it was vegan ☺ Now, I’ve made some pretty good ratatouilles in my day, but I am sad to report that this wasn’t one of them! I don’t know what my deal was—I guess it was just an off night for me. That, and I was operating on only about 4 hours of sleep and ended up being incredibly rushed at the end. The ratatouille was still pretty good, and Rob’s family, bless their hearts, wouldn’t stop raving about how wonderful it was. But it just wasn’t one of my best. They’ll have to come over some other time so that I can show them what I’m really made of! Party #2 was also completely vegan, though I did set out cheese for anybody who wanted it. I’d also whipped up another vegan chocolate cake, because the one for Party #1 was all gone. This time I was more careful about measuring out the ingredients, but it actually turned out to be not as great as the previous night’s cake. I think its because I added too much vanilla. At least now I know for next time, right? In addition to the cake, we also had vegan ice cream. Rob had selected two kinds: Soy Dream Chocolate Fudge Brownie and Rice Dream Vanilla. Everybody tried some of each kind. I never was an ice cream person, so I can’t say how it compares to the real stuff. In my opinion, the vanilla was not that great, but the chocolate brownie flavor was fantastic. After everybody left and I was putting stuff away, I found a container of freshly made basil pesto that I had completely forgotten to set out. I couldn’t believe I had forgotten all about it, since I’d made it from scratch just about a half an hour before everybody arrived. Although from what I hear, its not the first time that some portion of a Scho family dinner was accidently forgotten about and left in the refrigerator. 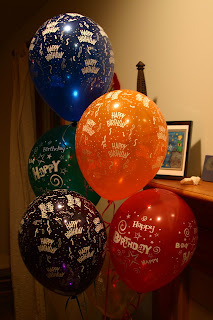 Today was Rob’s actual birthday, and at some point in the future, I’m sure he’ll blog about how he spent his day. As for me, I did my last 8-mile run before next week’s marathon, and then I tore down the garden because the forecast calls for frost tonight. I brought in a giant paper sack full of green tomatoes, in hopes that they’ll ripen indoors. Its so cold and windy today that I feel like I should be putting up a Christmas tree or at least drinking mulled cider. Unfortunately we don’t have any mulled cider. What we do have is a lot of leftover wine that people brought to the party on Friday night but nobody drank. That 2007 Beaujolais is looking pretty good to me, so we’ll have to see if it makes it through the night. That’s all for now. 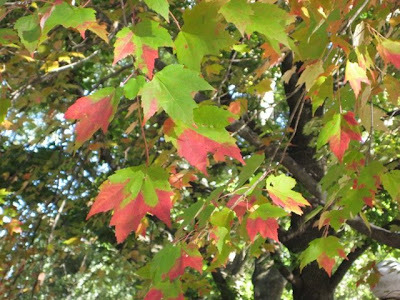 Here’s a picture of a neighbor’s tree; I love how the tips of the leaves have all turned red, but the bases are still green. Thanks for reading. Sounds like Rob had a wonderful birthday. Now, I have to go take a nap, because I am tired just reading all that you did!! FOOD LOOKED WONDERFUL!! Now, I have to put on my winter coat and pick up ALL the limbs and branches that blew off the trees yesterday. One good thing, blew A LOT of the leaves away, saves on the raking. Yeah, I had always planned to sneak meat into my vegitarian friends food, and then when they all said how good it was to yell out "Surprise everything is made of meat... even the tiny carrots..."
I have not gotten around to it yet, maybe Christmas. Wow... Martha Stewart goes vegan. I am impressed. It looked beautiful and it sounds like you outdid yourself. Hope that you can rest up after your weekend full of fetes. Maybe the Beaujolais will help with that. Good luck with the marathon!